Sometimes the interplay of Malibu-level luxury—tie-dyed cashmere “hand-airbrushed in L.A.”—and demonstrative backwoods roughness à la “mud-dyed shirting” struck a discordant note at this Amiri show. Yet if you let the music take you, this was a generally beguiling cover version of an acoustic California troubadour masculine standard, presented alongside its womenswear equivalent. Unusually, the opening movement seemed more evening, unless you are the kind of guy who wears his tight leather pants over pointed black suede stack-heeled Chelsea boots under a black bomber jacket etched in lines of music sketched in Swarovski by day. All black, it played Vibram soled suede bikers alongside tucked-in cashmere combat pants under retro-military tailoring and tailcoats, sometimes frogged. 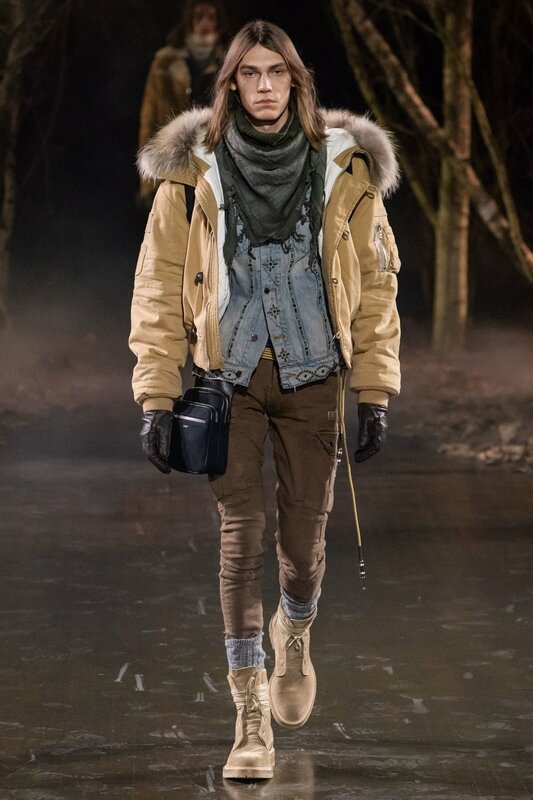 Many of the jackets featured shadow-embroidered guitar straps running above the shoulder and across the body, also in Swarovski. Movement two incorporated first olive and then checks—and python-print chiffon dresses in red and gray for the women. The silhouettes stayed the same, albeit with an additional exhale to long, apparently roughly knit cashmere cardigan coats, tailored cashmere overcoats, and underlayer shearlings. What looked at first like narrow cords of climbing ropes used as belts were in fact chunkily jacked amp cords strung through belt loops alongside dyed coyote tails. There was a shearling-face guitar case—there were a lot of handsome guitar and mandolin cases—teamed with a shearling-face blouson. Jeans patched with panels of fabric used in the outerwear looked good. Toward the end, Amiri faded to very near white. 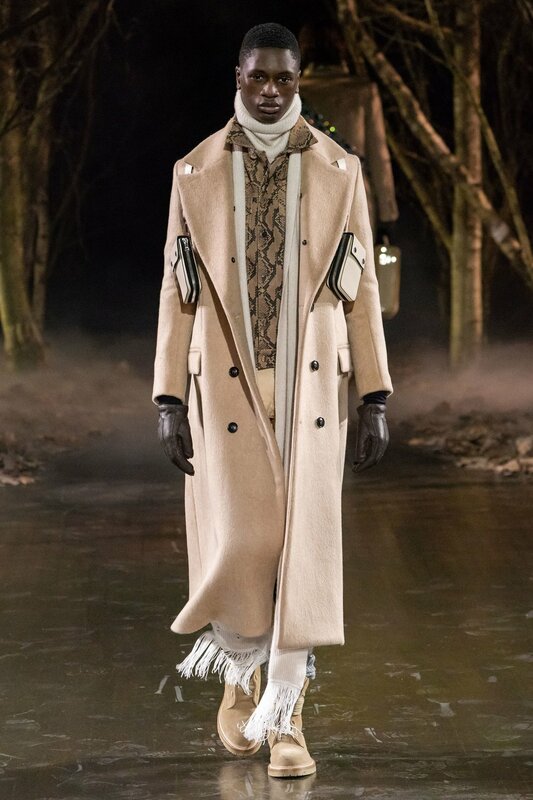 A long beige overcoat was worn with a cream leather shoulder-holster harness attached to two envelope-size leather pockets that rested alongside each pectoral. 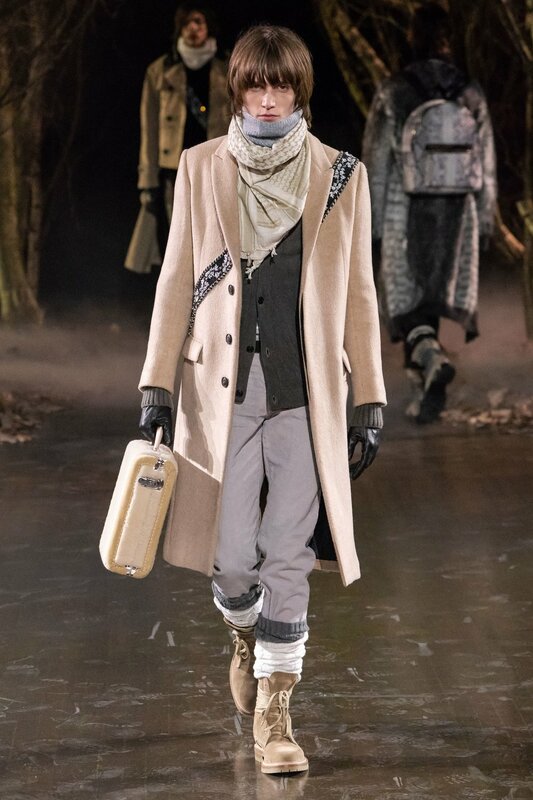 A contemporary fusion of ingredients you could pitch as Bruno Cucinelli–meets–John Varvatos by way of old-school Roberto Cavalli, Amiri’s fresh-feel arrangements made mostly sweet music.